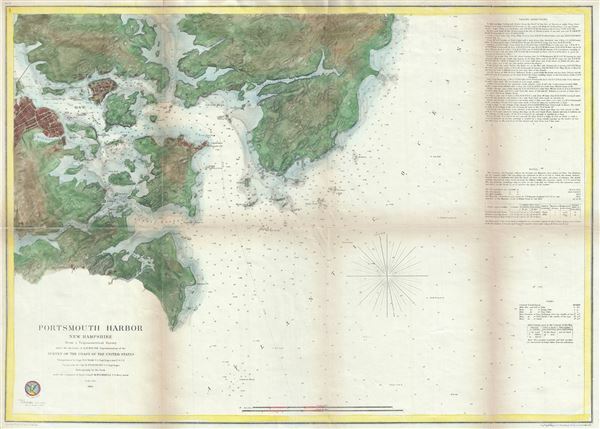 This is a beautiful example of the U.S. Coast Survey's 1866 nautical chart or maritime map of Portsmouth Harbor, New Hampshire. It covers the city of Portsmouth, New Hampshire, and its vicinity from Odiornes Point and Sagamore Creek to Chauncy's Creek and Spruce Creek. It includes Great Island, the Navy Year, Kittery Maine, and countless smaller islands. This 1866 map represents the culmination of the Coast Survey's work in the vicinity of Portsmouth. Unlike earlier issues, this example presents rich topographical detail as well as hydrographical data. There are countless depth soundings throughout and the right-hand quadrants feature sailing instructions, notes on tides and light houses, and a wealth of other practical information for the mariner. The city of Portsmouth itself is beautifully illustrated with numerous individual buildings and all major streets rendered. The triangulation for this map is the work of T. J. Cram. The Topography was completed by H. Stansbury. The hydrography was accomplished by parties under the command of M. Woodhull. Stansbury, it should be noted, had previously completed the first accurate survey of Great Salt Lake in anticipation of a transcontinental railroad and is one of the most important cartographers in American history. Though this chart is a minor production compared to his other pieces, his association with it bears note. This chart was published three years after Stansbury's death, so we can assume that it must have been one of his final projects for the Army Corps of Engineers. The whole was compiled under the supervision of A. D. Bache, one of the most influential American cartographers of the 19th century. Howard Stansbury (February 8, 1806 - April 13, 1863) was an important surveyor, cartographer, and explorer who did his most important work in Utah during the middle part of the 19th century. Born in New York City, Stansbury trained to be a Civil Engineer. Shorty after getting married to Helen Moody of Detroit in 1827, Stansbury took a position with the United States Topographical Bureau. Under that organization he surveyed the James River in 1836, and the Illinois and Kaskaskia Rivers in 1837. In 1838, he oversaw the construction of a road from Milwaukee to the Mississippi River. Later in 1838, when the U.S Corps of Topographical Engineers was created, he joined as a first Lieutenant. With the Topographical Engineers he surveyed the Great Lakes, the harbor of Portsmouth, New Hampshire, and constructed Florida's Carysfort Reef Lighthouse. During the Mexican-American War he constructed fortification in the Dry Tortugas at the westernmost point on the Florida Keys. Upon achieving the rank of Captain, Stansbury received a commissioned to head a survey of the Great Basin that would ultimately become the crowning achievement of his career. His assignment was to survey the emigrant trails to California, including the Oregon Trail, as well as the Great Salt Lake, and report on the status of the growing Mormon Community in Salt Lake City. Working with J. W. Gunnison and Alfred Carrington, a Mormon scout, Stansbury produced a masterful survey of the region that had a lasting effect not only on the development of the Great Basin, but on the development of the west in general. Upon completion of his survey, Stansbury set out on the road to Washington, completing another important survey in the process. On the way, he fell off his horse, taking an injury from which he never fully recovered. Following the presentation of his report to Congress, Stansbury was charged with additional survey work around the Great Lakes. Upon the outbreak of the American Civil War, he was assigned to recruitment duties in Ohio and later Wisconsin. Shortly after starting work at this post he suffered an abrupt heart attack and passed away. He is buried in St. Paul, Minnesota. Bache, A. D., Report of the Superintendent of the United States Coast Survey, (Washington) 1866. Very good. Some damage and toning along original fold lines. Backed on archival tissue.